Giant wedding wreaths are in RT mode in the 2018 wedding season. Now, when I say giant, I mean G-I-A-N-T. These are not your ordinary holiday wreaths hanging on your mother’s front door. Let’s take a look at this trend and a couple of how-tos you can tackle for a few bucks! 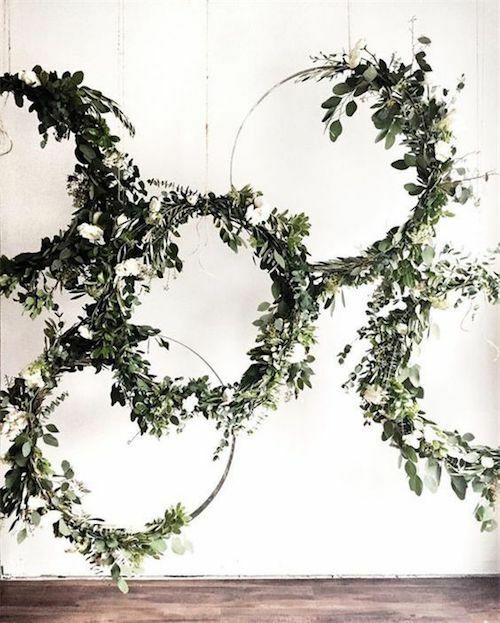 DIY an oversized grapevine wreath with greenery and white blooms used as a swing. 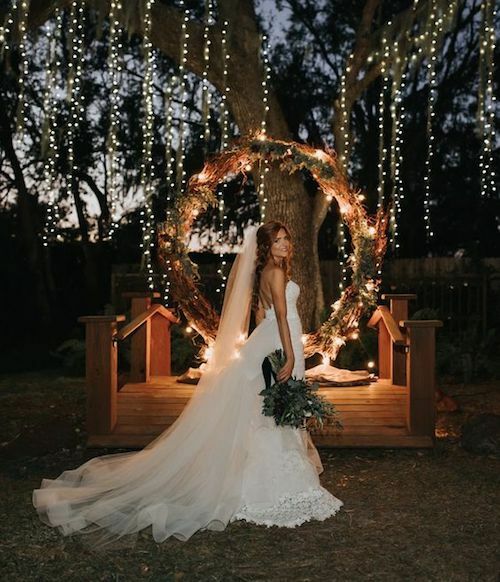 Giant wedding wreaths covered in everything from flowers and greenery to driftwood are popping up on the wedding scene everywhere. 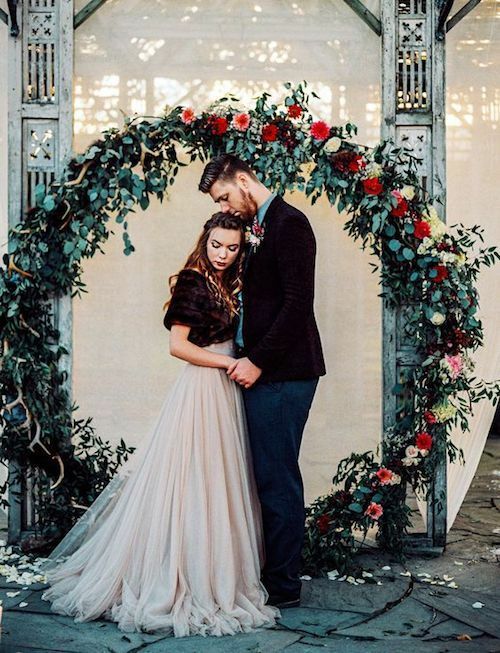 These are flawless works of art that can act as stunning ceremony or photo booth backdrops, reception decor, or staging for your couple’s and framily photos. 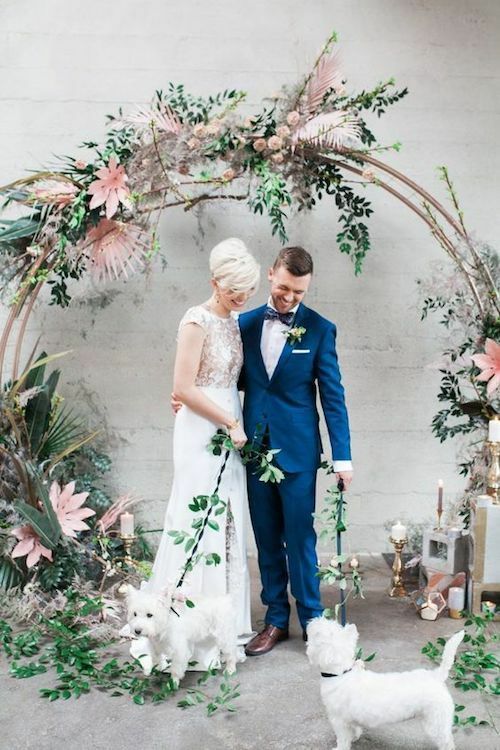 Couples are even creating unique masterpieces for their special day by taking these already amazing pieces and hanging lanterns, crystals and large floral pieces from them. Why not you? How Much For Those Giant Wedding Wreaths In The Window? Please don’t think an item such as this is out of your reach. There is the option purchasing a giant wreath from a florist. However, such a large piece comes with a high price tag. Even the not so large giant wedding wreaths can range in upper $600’s. The urban aesthetic could not miss out on this trend. 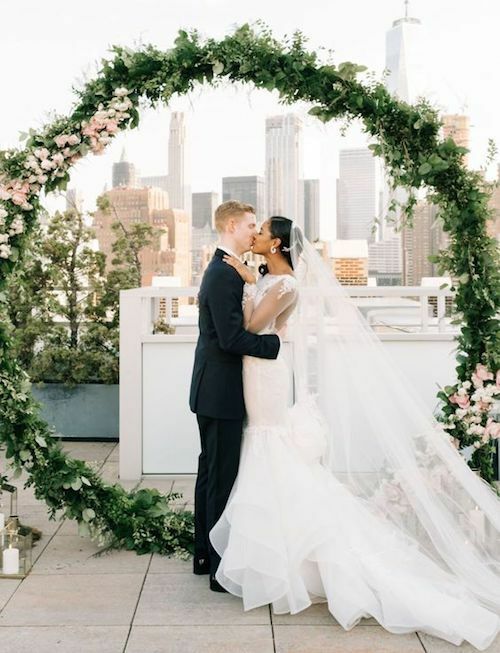 Turn your NYC rooftop into the most extra party of them all with the skyline views and a giant wedding wreath ceremony backdrop. 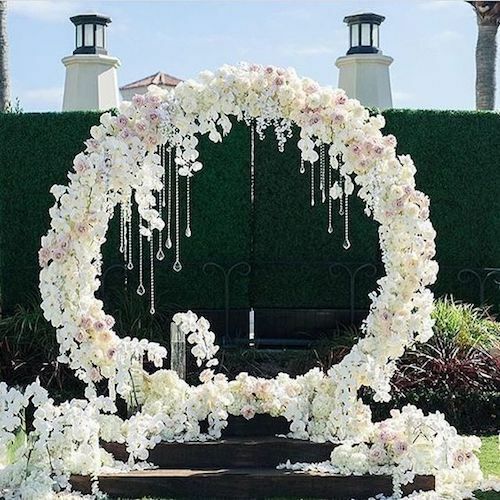 Get your bendable pipes and hola hoops ready because i can’t even explain how sick these giant wedding wreaths are. If your wallet is screaming a resounding “No, thank you”, know that there is always the DIY option. While it may seem like an enormous task to undertake, it is possible to create one of these darling features yourself. This can be a far better option; not just because of its reasonable cost, but because it gives you the ability to show off your honed-in DIY skills. 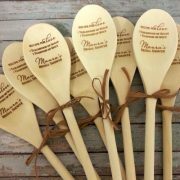 After all, your guests’ eyes will be glued to it! 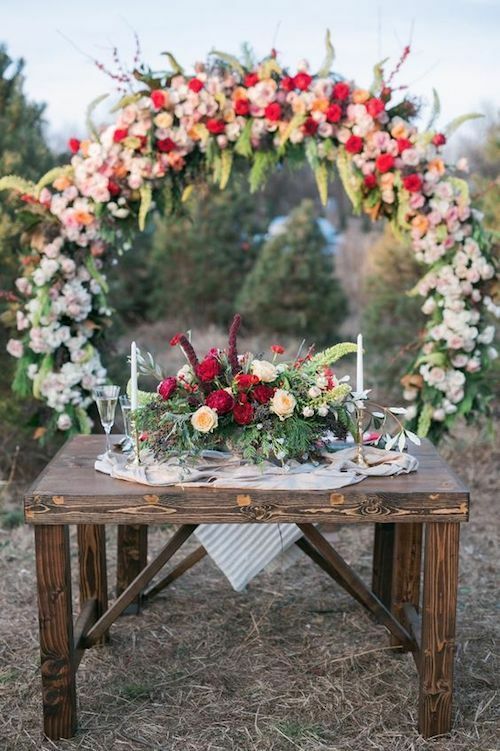 If this is not the most adorable sweetheart table, i don’t know which one is. The giant wreath backdrop completes the vibe. Greenery giant wedding wreath for reception decor. For those of you who barely know which end the glue stick goes in. Don’t freak out. It is a surprisingly easy process once you get going. 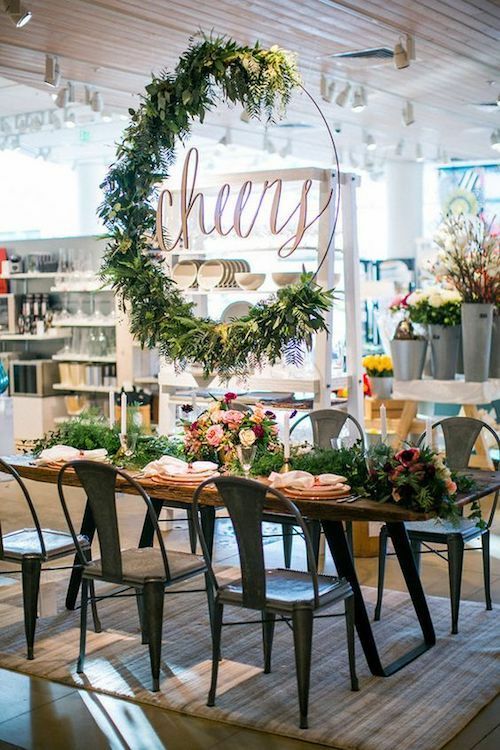 And you’ll be mystified by the number different DIY options available to create giant wedding wreaths. For the following DIY we will use silk flowers but if you are a more advanced DIYer, feel free to switched them for fresh flowers and greenery. 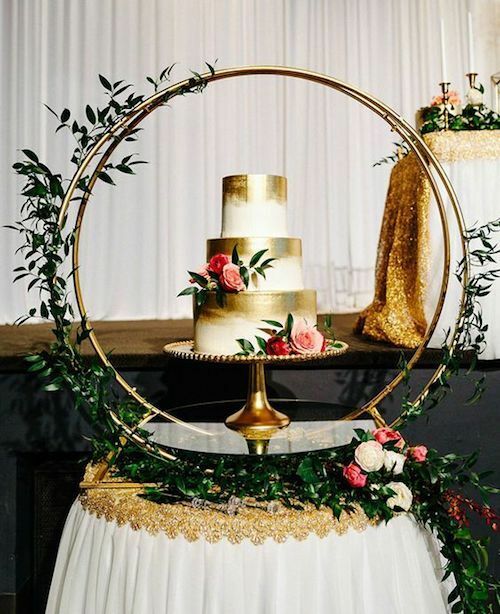 Here are the instructions to DIY a giant wedding hoop on a budget. 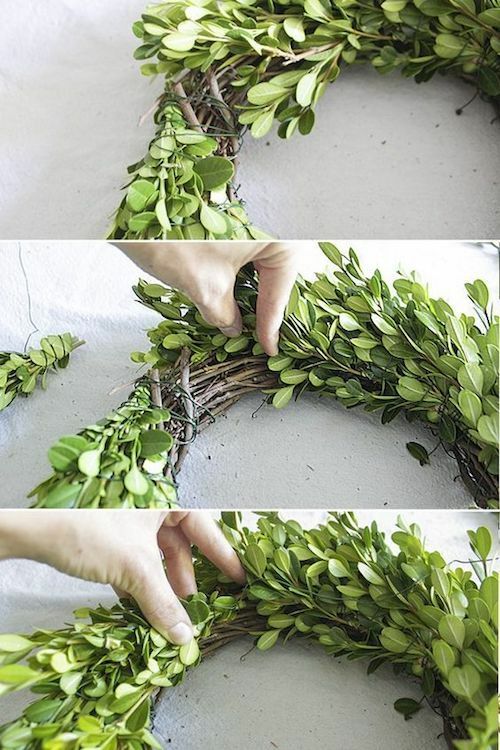 Instructions for making a giant wedding wreath on a budget. Optional step: If you want to paint the hula hoop, this is when. Let it dry, and continue with the next step. 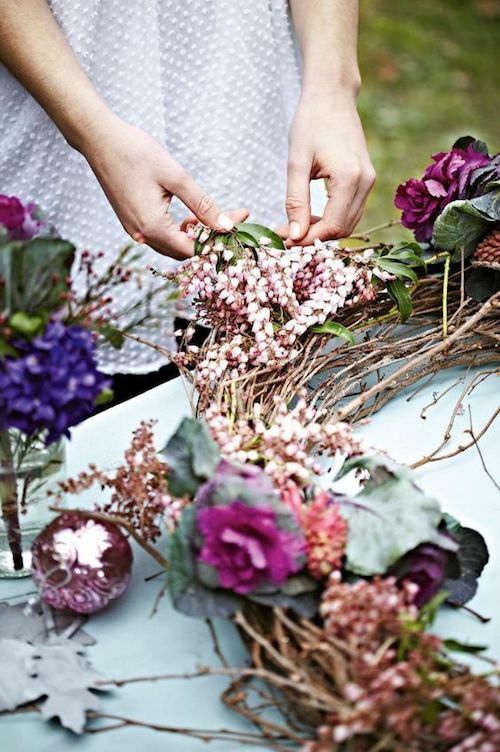 Create several bundles of flowers, leaves and berries – 5 to 10 bundles depending on the size of your flowers and hoop. Make sure to add in variety of colors and textures; this will give your creation a more robust feel. Then tie them off with the floral tape or zip ties. Lay out the bundles over the hoop before securing them with floral wire around the stem and hoop. This will help you ensure you will get the look you want. Overlap the bundles in both directions to hide the wire. When you are finished, cut off the excess stems with your wire cutters. Tie a ribbon on top of the hoop and you’re ready to hang your design! 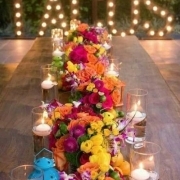 Savings Tip: No need to cover the whole circle with flowers, leverage woodbox and evergreens. You’ll save a lot of moolah and you won’t lose any of the original aesthetic. 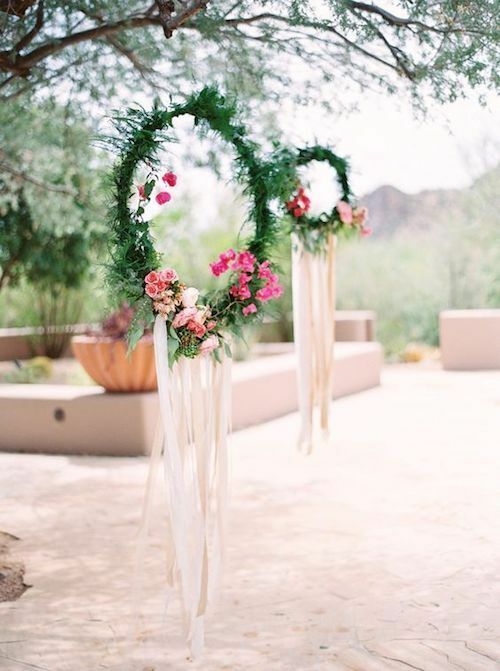 You can also tie the hula hoop wreaths with clear thread and hang the ribbons off the bottom of the giant wedding wreaths. Be a little extra with a giant floral wreath at your reception. 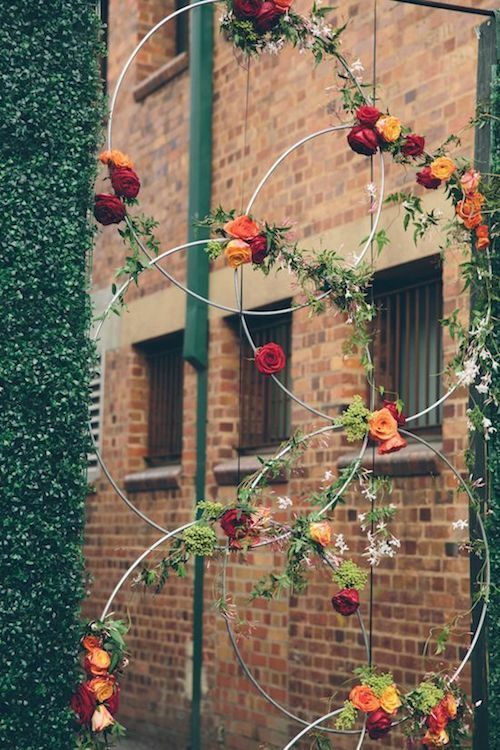 Follow these how-tos to DIY these giant wedding wreaths to decorate modern urban inner city venues. Now if your wanted to make one of those bang-up wedding swings for the bride; you can do so with $50 and a little elbow-grease. Let’s go through the materials you will need to make your dazzling creation. How to DIY giant wedding wreaths out of woodbox. Create the seat of the swing: Attach a 1×12 inch plank of wood to the base of the octagon using 2 U-clamps. 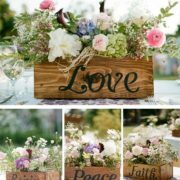 Once the swing is securely hung, decorate it to your heart’s desire using flowers, twigs, greenery, crystals, ivory cords and more! Now, you that you have the know-how; deciding on adding giant wedding wreaths should be a no brainer. 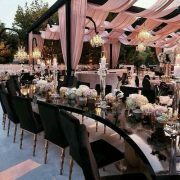 It will be that statement piece that will leave your guest awestruck. 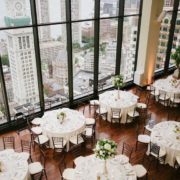 Creating a unique and dramatic ceremony backdrop has never been easier. 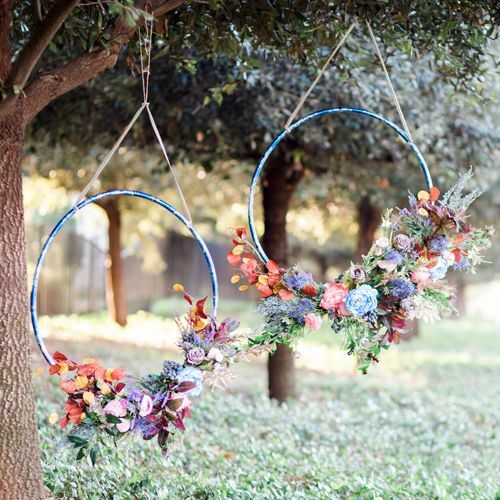 Check out how to DIY giant wedding wreaths with hula hoops. Gnarly idea for giant wedding wreaths. Make it your cake stand. White and blush flower giant wreath with hanging crystals for a glam vibe. So, what are you waiting for? Come and jump in on the trend that has the world going cray. It’s your big day, your entitled to being a little extra. So, don’t let anything kill your vibe.